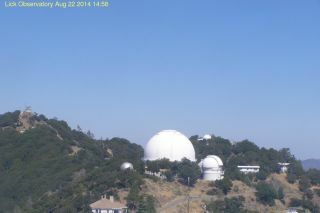 In this webcam view of Lick Observatory, the dome of the Shane telescope is in the center. To its left is the Crocker dome, which houses a specialized telescope for finding exoplanets. Just to the right of the Shane dome is the Automated Planet Finder. Above the APF dome is the Katzman Automatic Imaging Telescope, which searches for supernovae. Lick Observatory is an astronomical research facility in California that has been in operation since 1888. Astronomers at Lick are searching for planets outside the solar system, trying to understand how stars and galaxies came to be, and doing a survey of supernovae to learn about the universe's history. The University of California owns and operates the observatory, and in 2013 initially announced that it would stop funding for Lick in 2018. In November 2014, however, the university reversed the decision and said it would continue to provide the $1.5 million annually that Lick requires for operations. The facility sits at 4,200 feet (1,280 meters) atop Mount Hamilton, which is east of San Jose, California. Funding came from James Lick, who bought 37 tracts of land in San Francisco in 1848, just weeks before the gold rush, according to the observatory's website. Lick bequeathed funds before he died in 1876, desiring a telescope that was "superior to and more powerful" than others that came before it, states the observatory's website. "Lick's deed of trust did not spell out the details of the new observatory, leaving the board of trust great latitude and a great burden of responsibility in carrying out his wishes," the website added. Most telescopes of the era were built in cities, but astronomers were rapidly meeting with disadvantages as light pollution became more prevalent. This led astronomers to choose a mountaintop site instead for the new observatory. Lick bills itself as the "first permanently occupied mountaintop observatory in the world," and currently houses several telescopes. Lick's extrasolar planet search involves monitoring about 1,000 stars that are close to the sun's age, temperature and luminosity (intrinsic brightness), Lick states. This is done using the Shane reflector telescope and the Hamilton spectrograph, as well as a newly built Automated Planet Finder. "Many Jupiter-size and Saturn-size planets have been discovered. As technology improves, smaller planets will be discovered more frequently. The ultimate goal of extrasolar planet search is to discover a solar system similar to our own, with Earth-like planets that may support life," the Lick site states. "The Katzman Automatic Imaging Telescope (KAIT) is programmed to search robotically for distant supernovae on every clear night of the year," Lick states. "If KAIT 'sees' differences in luminosity within a galaxy, indicating a possible supernova, it notifies astronomers, who investigate further using the Kast spectrograph." Lick's outreach program includes a summer observation program in which visitors are allowed to look through the 36-inch (91 centimeters) Great Lick Refractor and the 40-inch (101 cm) Nickel Reflecting Telescope. Additional telescopes from amateurs are available outside. Astronomers also give lectures on their research. The Friends of Lick Observatory is a group that encourages the community to contribute to the telescopes. Some ongoing projects in 2014 include raising money for refurbishing the 36-inch refractor and constructing a Shane Adaptive Optics System to improve what the telescopes can see through the turbulent atmosphere.